In this chapter we provide an overview of the theoretical perspectives informing research and practice in early relationships, including attachment theory, psychodynamic theory, sociocultural theory, infant mental health, synchrony, the biopsychosocial model, and risk and resilience. 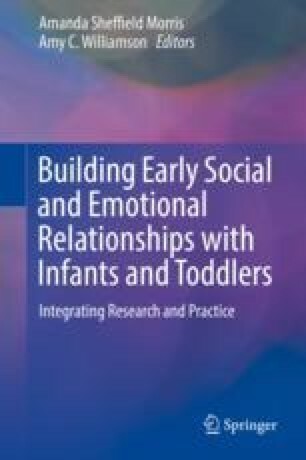 This overview is followed by future directions for research and practice in building early relationships. We present an integrated model of infant mental health that incorporates current knowledge about the effects of early experiences on development (e.g., toxic stress, adverse childhood experiences, protective and compensatory experiences, and neurobiological research). We describe challenges and opportunities that may arise when applying infant mental health within other disciplines, such as early childhood education, pediatrics, psychiatry, psychology, and developmental science. We end with an example of an integrated set of interventions developed and implemented at the state and community level, providing practical suggestions for including infant mental health in practice, research, and policy. Work on this chapter was supported by the George Kaiser Family Foundation and the Tulsa Children’s Project. There is no such thing as a baby … if you set out to describe a baby, you will find you are describing a baby and someone. Did you have someone who loved you unconditionally (you did not doubt that they cared about you)? Did you have at least one best friend (someone you could trust and had fun with)? Did you do anything regularly to help others (e.g., volunteer at a hospital, nursing home, church) or do special projects in the community to help others (food drives, Habitat for Humanity)? Were you regularly involved in organized sports groups (e.g., soccer, basketball, track) or other physical activities (e.g., competitive cheer, gymnastics, dance, marching band)? Were you an active member of at least one civic group or a non-sport social group such as scouts, church, or youth group? Did you have an engaging hobby – an artistic or intellectual pastime either alone or in a group (e.g., chess club, debate team, musical instrument or vocal group, theater, spelling bee, or did you read a lot)? Was there an adult (not your parent) you trusted and could count on when you needed help or advice (e.g., coach, teacher, minister, neighbor, relative)? Was your home typically clean and safe with enough food to eat? Overall, did your schools provide the resources and academic experiences you needed to learn? In your home, were there rules that were clear and fairly administered?